Bonjour. C’est la vie, as the French say. And the Cajuns of Louisiana – which brings us to the next Marvel character under discussion here: Remy LeBeau, a.k.a. Gambit. 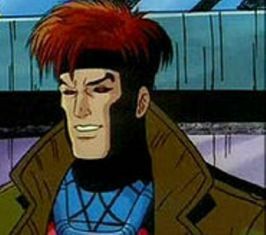 The first introduction I had to Gambit was in the 90’s television series. His back story there is one I have often found to be a likeable twist of storytelling: a thief (or other sundry character) joining a team of good guys to be reformed into a real hero. It was great to see Rogue and Gambit fight – as much with each other as with the bad guys! Because of her powers, Rogue wouldn’t let Gambit get close to her, but it was clear that he really did love her, and vice versa. Now that you see how the TV series shaped my opinion of the character, imagine my consternation when I began reading about his comic book history. Much of it makes very little sense to me, I admit: the few X-Men comics I have are fragments of story arcs, and the ones that include Gambit have him pretty close to what I saw in the TV series. So the winding maze of his life events in the comics are lost on me faster than a cat would get lost in a pile of yarn. The two things that did jump out at me were: a) his assistance in the slaughter of the Morlocks (aside from one small girl he purposely rescued), and b) his expulsion from the X-Men. Gambit has always had a soft spot for children (as shown in how he treated Jubilee in the TV series) which has been more likeable than his tendency to flirt with every lady he meets. If there is a list out there of the top ten flirts in Marvel Comics, I hereby nominate Gambit for first place! To get back to the point, I can easily see Gambit working to protect a Morlock child from death; but aiding and abetting the killing of countless other Morlocks, several of whom were also undoubtedly children? That’s not the Gambit I came to know. He wouldn’t have helped; he’d have turned on his employer (Mister Sinister, I believe it was, in these comics) first, and died before he got too far into the tunnels rather than commit murder. As for his expulsion from the X-Men, it’s uncharacteristic of the X-Men on its face. The X-Men have accepted Wolverine as a teammate, Archangel, Emma Frost, and even Mystique at one point. Wolvie’s record is far from clean; Archangel has been used by several bad guys to kill numerous innocents, and more perhaps when he’s ‘lost’ himself in misery or pain; Emma Frost is constantly shifting between good and bad, and DO NOT get me started on Mystique. So after accepting these and other less-than-good citizens of the Marvel universe into the fold, suddenly the X-Men decide that Gambit’s not good enough for the team, after all he’s done for it? That’s a bit out of character, isn’t it? And sending him back to work for Sinister is just plain wrong. Once bitten, twice shy. Sinister is trouble, and being a thief for as long as he was, Gambit would know better than to risk his neck by running with a man who wouldn’t think twice about slitting his throat. To top it off, the whole fiasco has thrown a giant monkey wrench in the romance that he and Rogue had going. Talk about a sad thing. After Jean and Scott, Rogue and Gambit were two of the X-Men who deserved to be together romantically. Getting them married would also have been a big plus, and a way overdue event for the team. Why do this to Gambit at all? Was it to make him a more complex, or appealing, character? He was already both with his easy manner, which hid a genuine distaste for his past actions and a desire to leave them behind. Was it to make him a really dark, really noir protagonist? Why? All it’s done is to ruin him as a hero. Gambit was an intriguing member of the team for his remarkable desire to be good cloaked in nonchalance. Now he morally resembles the Creature from the Black Lagoon. With all due respect, fellow writers, he really didn’t need a slime bath. He was just fine the way he was, and readers are going to miss the old Gambit, as they are going to miss other wrecked characters, several of whom I have listed in other letters. So au revoir, fellow writers! The aces are in your hands. All we True Believers have got at the moment are a set of black eights. This entry was posted in Marvel Comics' Characters and Stories and tagged comics, Gambit/Remy LeBeau, Marvel, Marvel Comics' Characters and Stories, Professor Charles Xavier, Rogue, superheroes, The Creature from the Black Lagoon, the Morlocks, the X-Men, why? on May 16, 2013 by The Mithril Guardian.